Although we are no longer stocking Wyoming Trader's clothing, we will still special order any item from Wyoming Traders for you! 25% GROUP OR 10 OR MORE ITEMS DISCOUNT BY SPECIAL ORDER! NO RETURNS!! Colors: Black, Charcoal, Brown, Tan & Red! Colors: Black & Charcoal Only! 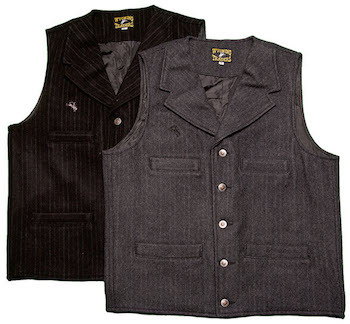 Wyoming Traders ”Bronco” Men’s Vest Our canvas vest is cowboy equipment! It is made of 11 ounce cotton canvas, and has an elastic back for a great fit. The lining is satin and all the seams are reinforced for durability.